Though if I'm to be totally honest it's really just a fantastic illustration of me with some words under it. I mean seriously, that is uncanny. In fact I actually wore a jersey in that same color scheme yesterday, which I'm just now realizing means I'm being followed. "In fact I actually wore a jersey in that same color scheme yesterday..."
Were you also riding with aero bars? Also, it appears someone just took the head shot photo that is above your by-line, traced it and then drew everything around it. I like that Taj has depicted you riding a crabon triathlon bike wearing baggy shorts and sandals. It’s like the original usage of Fred and the bastardized version in the same image. I need a recumbent with an integrated easel. that cartoon bike doesnt have any breaks. can't stop. won't stop. know what else won't stop? this burning when i pee sometimes. would go see the doctor but i have been spending a lot of money on outdated and heavy non carbon bike parts. On my bike every weekday before 6am for a 45 minute ride to work. I quickly found out that early morning is truly the best time to ride. Early spring and late fall, you see the sun rise and your pedaling shadow stretching to infinity. On most morning there is no wind, no traffic noise and smell. Just you, your bike and the road. The earth is a giant roller and your pedal strokes raise the sun. Yes. Exactly. Well said Wildcat. Did you file them down like that so they are more aero? Yes, With arrow-bars, on a fixie, no brakes, no-handed, while wearing spd-sandals, and air-conditioned top-knot. Bueno burritos. Will Wildcat transmogrify into the Wolf? Might try to reenter the early morning schedule, especially now that the weather is kinder. And good point about having the rest of the day not worrying about getting a ride in. Wow, that sure is one good looking guy. Not sure #whatpressureyourunning, but your front wheel needs some professional attention (by a professional cartoon character wheel builder obviously). Tried to get my dog up early this morning for a canine themed commute. His book club ran late last night. I'm not sure what happened, but they trashed the living room. Early morning before much traffic and sun exposure is lovely. I only experience this when commuting though. For a Sat/Sun adventure? I'll take breakfast with the family. Meet me for a buzz at high noon. Trees and buildings are casting shadows by the time the sunblock sweats off and the bars are open when rolling back into town. leroy,did your dog say "tag,you're it" ? Butterflies do not fly in the early morning, they need time to warm up. That aside, an excellent illustration and article, too. My dermatologist told me several years ago to get out of the sun, "or else" and I don't believe he was joking. I've been an early morning rider since and I love it, except for the fact that I'm riding about half as much as I used to, since I don't make it out of bed about half the time. Group rides and skiing are just about the only reasons I'll get out of bed before 7:00 am. Early mornings are not my thing in my current life. More power to you! Dear Mr. BBotS @2:40 PM - I'd have to ask my dog, but he says he has a really bad headache today and doesn't feel like talking. Which is odd. Usually, you can't shut him up. All the illustration needs to complete the irony is a bubble with WCRM singing Zip-a-dee-doo-dah. Wait a minute...there were exams in college? 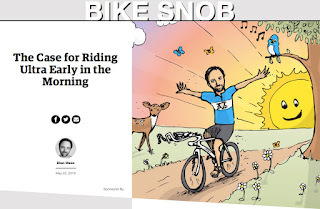 "(Of course, so too can riding to and from work, but that’s another subject.)" Do I sense another Outside column brewing? Pb was right, I see no breaks in that bike anywhere. No cracks, no fissures, no crabon tubes pulling out of their lugs, no splits or knots in the grain (because we all know that The Snob will only ride crabon if it's wrapped around trusty wood). I bet, though, with two sets of brake levers, he's got plenty of stopping power if he needs to avoid running into one of those early rising butterflies. i am a bit annoyed that i just read the Outside article and am somewhat contemplating trying this early morning nonsense out. its a toss up as far as safety so i may just give it a go. thanks for the inspiration to set an alarm...cause that's what i want...living life according to the european man's clock. Someone on a recumbent with a sketch pad? That creepy sun is staring right at Uranus. Oh dear. "wow, this pillow sure is crappy. i wish i had a cool down pillow like at the nice hotels but those are like more expensive than nice bike parts and i can't afford that sort of thing, but even as not-as-comfortable as this pillow is, its still way more comfy than getting out of bed on out on my bike"
so, i made like the first step. maybe tomorrow i'll get up and hope to get to at least the coffee phase and maybe in a week or so i can train like a pro and make it to my bike by like 7am or so. Hee Haw...that's funny sh*t.i meant the part about the helment.the video was funny as well.ah,the heck with it.they both were.kudos. BSNYC: "Working the bike into a chaotic day can be stressful..."
True dat. But... whenever I do it, which is often, I never regret it. On most lovely mornings, when I'm cranking to work, I find myself wishing I'd left an hour earlier, in order to take the scenic route. Did you say Recumbabe is a sketchy bike cyclist? Some activities are only possible on a recumbent.